Patchwork quilt of pieced repeat blocks in 'T' pattern,mainly cottons. Quilt is constructed with 12 blocks across and 12 blocks down. Some fabrices have been reused from clothing, some blocks have patches which have been pieced from scraps to make enough fabric for the pattern. Padding is' pellon', quilt is backed, bound and quilted. 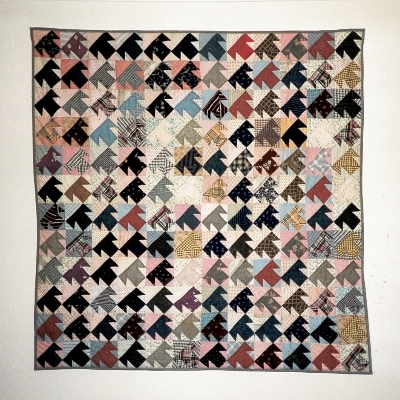 Pieced quilt top bougnt at auction in London, Ontario, Canada in 1987 by the owner. Quilt top finished, padding, backing, quilting and binding, by owner's mother. "I purchased this quilt unfinished at a deceased estate auction sale in London, Ontario, Canada in sept 1987 whilst holidaying there. I gave it to my mother who completed it. She completed it with pellon wadding, backing and quilted it. The fabric is small prints, checks, dull colours, no greens or bright colours. Some fabrics appear 'pre-loved', I.e. used in men's shirts, aprons etc, Some blocks contain fabric which has been stitched together to obtain maximum use of all scraps. Some 'Ts' are made of similar coloured fabrics, others are constructed of the same fabric. My mother feels this is an early 20th century piece." [It is not known who pieced the top.] "At the time I was not interested in patchwork and quilting myself - now I do regret not getting more information on the day of purchase." "At the auction sale the quilt was stored in a rusty old tin trunk. The auctioneer was having trouble getting a bid, when he opened the lid and pulled out the quilt I immediately said $5.00 and it was mine - not one bid against me."